Our new 1911 grip screws in polished stainless fits the hugely popular 1911 family of pistols, from the fullsize government model pictured below, to the smaller compacts from Kimber, Colt and others. These new spanner screws feature crystal insets in the centers. Each screw kit is made right here in Flint Michigan USA, then hand polished. Finally, each gem is set by hand by one of our artisans. The polished stainless screw goes with any gun finish and grip style, while also allowing the gem color to take center stage. 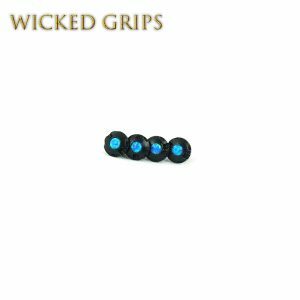 Fitment: Fits all standard thickness 1911 style grips.. 1911 Government, Commander… Bobtail and Roundbutt.. compact models.. and Coonan, using the standard 1911 grips screw bushing. Will NOT FIT guns set up for thin/slim grips and the small grip screw bushings. SCREW KIT COMES WITH TOOL! FOR STANDARD THICKNESS GRIPS, NOT THIN/SLIM PANELS. We have many different colors & styles of gemstones for those wanting a true custom look. 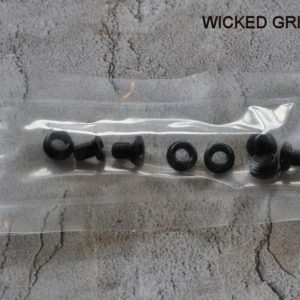 Each set comes with tool bit to fit screws… Each screw is designed to work with the factory grips, our Wicked Grips versions, as well as other after market grips with correct factory dimensions.